Asanoya's outdoor baths offer a different mood in each season. Our Hinoki tubs are made of 1000-year-old cypress. Inside the hotel, we have large indoor baths and low heat saunas. ・ Traditional Japanese bathrobes called Yukata are available for free. 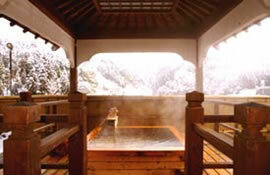 Outdoor hot baths in few guest rooms have the sophisticated design of Momoyama Period. The warm water is all from our own hot spring. 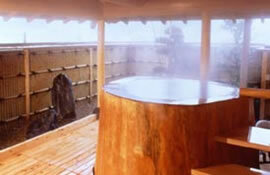 The round hot tub of Enji guest room was entirely cut out of a single 1200-year-old Hinoki tree. In the rising steam and surrounded by Japanese landscaping, enjoy a nostalgic outdoor bathing. Room 606 "Konruri" Room 208 "Enji"
・ Hours: Available from check-in to checkout. ・ Warm water: Coming from our hot spring. Copyright 2006 Asanoya. All rights reserved.